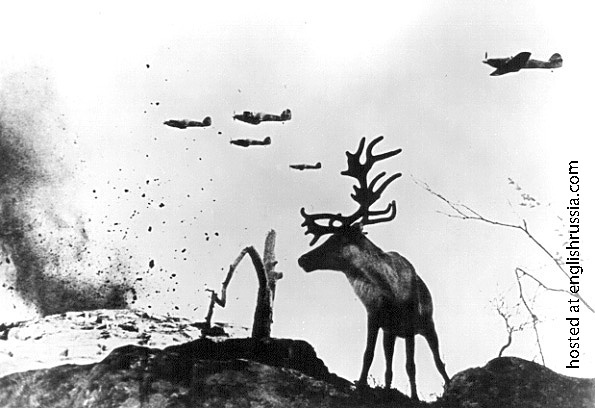 This is a real, unprocessed shot, made in Murmansk, Russia 1942, during World War II, real moose, real Nazi planes bombing Murmansk. Yes, very awesome photo, but that is not a Moose, as Mel said. I’d say it looks very much like a caribou. Now it’s my time to name a famous Russian photographer! This one is from Yevgeni Khaldey, the Soviet war photographer who incidentally also took the photo of the hammer-and-sickle hanging from the Reichstag. He died a few years ago in Moscow. I am not doubting that the photo is real. However, there is one error in the narrative. Those planes are British built Hawker Hurricanes. My theory is that they are Lend-Lease provided planes piloted by Soviet pilots in the interception of the bombers. I was studying that photo wondering about that very same thing That last plane is a Hawker Hurricane. But I did not know the Britts had the production to do any Lend-Lease. As they needed the aircraft themselves. I thought only the states did the lead-lease. Nope, Britain provided a fair bit of lend lease. And they used to run all the Arctic convoys that got the lend lease to the Soviet Union. Certainly several hundred tanks, planes and vehicles were sent. Those are definately Hurries, just look at the cockpit, tail and wingtips. Wow! Those are not Nazi planes. 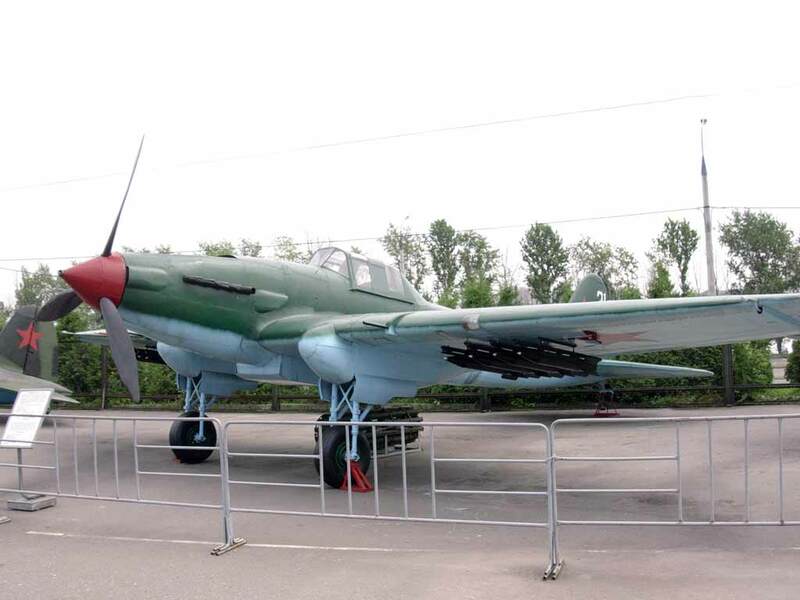 Those are Russian IL-2 Sturmoviks. They were flying tanks that were much feared by the nazis. The people who flew these planes were as much heroes as spitfire pilots in England. This is the best picture of them in action I’ve ever seen. Thanks English Russia you’ve made my day. ps I have nickname Sturmovik because I have a habit strafing people. Sorry IL2 fans. Those are Hawker Hurricains. Go find some pics and satisfy yourselves. My confidence that they’re Hurricains (probably russian as mentioned) is 100%. The tails are a clue. Also the canopy runs into the fuselage – unlike any IL2. I’m ready to concede that the plane nearest the photographer is a Hurricane and probably the 2nd nearest also. I still think the front 2 are IL2’s. The cockpit is too far back for a hurricane. Also has scoop on engine that no hurricane had. Rear of canopy is blocked by wing. Edge of rudder is too straight to be other than IL-2. I’m sending this photo off to Langley Air and Space Museum to see if they know. Some expert in Russia must know. Is there a higher quality version available? You are so gay for posting this. One more picture of IL-2’s in action. Now that the planes and animal have been identified… this is a really cool picture. One doesn’t immediately think of the wildlife caught up in the war. Those ARE hurricanes. You can tell via the nose (curls up), tail(slopes down) and wing (flat and thick) sections. As for the Moose I have no idea what type it is. Hawker Hurricanes, without a shadow of a doubt. Very artistic photo, nice find! I hav’nt and took me .5 second to know it was a reindeer. Hawker Hurricanes bombing their owns.